You've seen those historic placards--perhaps in towns that haven't attempted to methodically destroy every last historic building--that designate a town's oldest residence and such. Santa Rosa's got one too--the Hoag House, the oldest standing house in the city. Just take a drive or bike ride down Channel Drive toward Annadel Park's eastern entrance. Look to your left. There, uprooted and set down as if by a Kansas twister in a field down by the creek, the unfortunate house has been tossed out like an old car up on blocks. Unable to commit to destroy it or preserve it, the city leaves the house to the default fates of nature and vandals. What does the future hold for this historic eyesore? Here's an idea: Plop it in the middle of Courthouse Square and surround it with bollards (those things that line Fourth Street). Of course, then a four-lane tunnel would have to be dug underneath for Mendocino Avenue. . . . Now we're cookin'! Now we're thinking like a Santa Rosa planner. --J.K. He is the quintessential Marlboro man on his steed--only he doesn't smoke. He is a cattleman who refuses to eat commercially slaughtered meat. Yup, horse trainer Dave Clause is used to defying stereotypes. And over the course of his 68 years, this old Montana cowboy has dramatically changed his approach to animals. Clause has gone from a wrestle-'em-to-the-ground kind of wrangler (he once lost his thumb in such a battle of wills) to a teach-'em-to-trust-ya kind of guardian. Along the way, he's become Sonoma County's premier dressage trainer for young and difficult horses. Not only does he believe in learning new techniques himself, but he thinks that a horse is never too old to change bad habits or learn new tricks herself. Along with his thumb, Clause left behind training methods that rely on force. Instead, he gives horses the respect he wants from them. As he puts it, "Horses are certainly herd animals, and you simply want to become the leader. You want their respect, their cooperation." 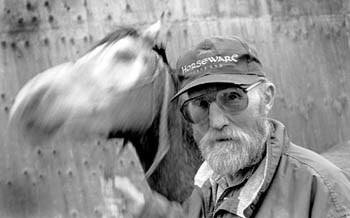 Dave Clause Horse Trainer. 707.292.9501. --K.A. Everyone from dentists to gardeners can be seen sashaying, two-stepping, and singing silently to themselves at Petaluma's Grocery Outlet. Featuring a backbeat you can't lose, the Grocery Outlet makes its customers at home by playing only original Motown, girl-group harmonies, obscure R&B, roots rock, early Beatles, and everything else the average discount shopper needs to dance in the aisles while figuring the sell-by date on the milk. As if savings ranging from 40 to 60 percent on staples and wine aren't enough, owner Mike Dilibero has the wisdom to use employee Lester Meagan to announce the daily specials. Lester is gifted in many ways, but for our purposes the fact that his voice sounds exactly like neocountry star Lyle Lovett's speaking tone is enough. Yes, it's a wonderful fantasy world in the Grocery Outlet, tapping an idle foot to Aretha as Lyle announces the specials. 80 E. Washington St., Petaluma. 707.763.2700. --G.G. I had a job that included checking bug traps for those dreaded vineyard pests the blue-green and glassy-winged sharpshooters, and I'd usually drive a truck along the edges of vineyards, by riparian or creekside areas. The directions the winery gave me to find the yellow traps amid the copious foliage of vine and forest were sometimes a little weird: "Stand on the Corvair." "To the left of the Cadillac." "Three rows from the old truck." It seems that over the last century, defunct automobiles have been North Bay farmers' main antierosion plan, and every stretch of the Russian River and its tributaries that I saw is strewn with the rusted hulks of Detroit's legacy. There must be hundreds of makes and models of all years, mostly stripped (and I'm sure all oil and toxic fluids drained and turned in for recycling, right? ), from a recently ditched Toyota to a rusted pickup from the jazz age, in a dry wash off of Westside Road, the art deco design of its speedometer looking surprisingly hip in the autumn light. --J.K.
Each week for nine long years, we'd load our begrimed unmentionables into the back of the car and set off to launder them, grumbling about the efficacy of getting them even slightly clean in the filthy environs given to the public. And then one day a gleaming ray of light came into our lives. As we were struggling to get nine towels and one sock fitted into the trunk, our neighbors appeared like heroic angels of the Tide. "Taking those to the Happy Hamper?" they inquired. The happy what? we asked. 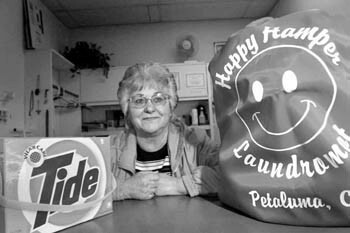 Staffed by actual humans such as owner Starlett Bruner, the Happy Hamper puts the dignity back into public laundering with clean counters, floral displays, and fresh paint. "I want it to be a cheerful place," Bruner explains. For two glorious weeks we were happy with the Hamper, and it was good. We were almost disappointed when the children's grandparents took pity on us and bought us a washer and dryer set. Almost. 1420 S. McDowell Blvd., Petaluma. 707.766.8688.--G.G. Teacher, writer, ordained minister, prankster, and witch, Obejoyful is true to her name. Each winter solstice, her West County home transforms into a gathering of guests who take a Persephone-like journey into the psyche's hidden wisdom. A magical, evergreen spiral coils down from the ceiling inviting the brave and the curious to step into its center and conjure their desired gifts for the New Year. A Wiccan practitioner for over 20 years, Obejoyful has developed the philosophy of Applied Enchantment. "Living well involves engaging the magical in the mundane," she explains. 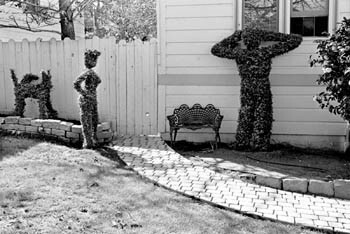 Obejoyful's experience is based on years of designing personalized rituals and workshops, such as the upcoming "Crazy Woman." Three thousand miles have come and gone and that oil is now about as useful to your engine as aloe. Thank goodness it's time for a service appointment! Thank goodness, because it's time to take the afternoon off and relax in the clean, serene comfort of Out West Garage's waiting room. The only auto service bay we've ever seen where all employees wear surgical gloves for cleanliness, Out West is a hidden oasis of calm. Owner Maria do Céu has outfitted her waiting room with all original artwork, provided an overstuffed couch and several roomy chairs, has plenty of children's toys on loan, and boasts the best magazine rack this side of Sawyer's. Add Maria's placid dog, her fifth-grade son's concession stand, and her own wacky sense of humor, and you've found the perfect place to hide while ostensibly doing a chore. Go for an oil change, stay for the afternoon. 321 Second St., Petaluma. 707.769.0162.--G.G. Yes, that's Martha lying in a swoon over there, under the hand-wrought wooden bench. Tucked away from the bustle and grime that generally describes Bolinas on a weekend day, the courtyard of the Bolinas Museum is a serene, gorgeously underused sanctuary. With its elegant plantings and clean, warm light, this is a perfect place to dream about perhaps putting a small lap pool in over there or ordering some handmade willow furniture for the alcove on this side. Such an extended fantasy life is well-served by the recent additions of sculptor Welton Rotz's fountain and stone bench, donated to the courtyard last fall. The Museum's no slouch either, showcasing both the uncanny history of Bolinas (where do they keep the town sign?) and the tremendous modern work of the visual artists residing along this stretch of coast. 48 Wharf Road, Bolinas. 415.868.0330.--G.G. Why drop them in Nevada when you can practice bombing one of the most pristinely beautiful sections of the California seashore? Following such curious logic, the Air Force chose the natural stone pillars found along the Sonoma Coast, on what is now the Bill Kortum Trail, for WWII bomb practice. Surely composed of sturdy stuff, the Sunshine Rocks survived this misguided bit of governmental wisdom to instead become the premier outdoor belay spot for North Bay rock climbers. So often used that its lower faces are clouded with chalk, this bit of Sunshine has been meticulously smoothed by the thousands of feet and fingers that have gripped it tenaciously, making scaling it all the harder. Smack between Shell Beach and Goat Rock, this out-in-nowhere colossus looms with a terrible beckon. Why bomb it? Because it's there. Why climb it? You know. Hwy. 1, 1.9 miles south of Jenner and 7.1 miles north of Bodega Head. Use the Shell Beach parking lot. Open dawn to dusk. Free.--G.G.